This laser multifunction device is aimed at a home setup, but with the print quality and wide range of connectivity options, it can even serve a medium size office. It also has a medium range duty cycle. 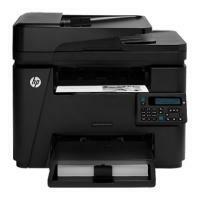 HP Laserjet Pro MFP M225DN comes with a 1200 x 1200 dpi printer and a 1200 x 1200 dpi scanner. Both do their job well and produce high-quality prints and scans. HP Laserjet Pro MFP M225DN Toner Cartridges are good for printing up to 1500 pages. Availability of compatible cartridges further brings down running costs. The connectivity options are via USB, ethernet, Bluetooth, and prints can be taken by HP’s ePrint technology. The instant on feature means first prints come within 10 seconds and its print speed is on a higher 26 ppm. Plus, the printer has a large paper storage capacity of 250 sheets at a time with a covered input tray that keeps the sheets clean and prevents dust from ruining on the top sheet. This printer has some good features for printers in a similar price range. It comes with automated double side print capability and its wide range of connectivity makes it a breeze to use. This usage could have been increased if it came with a longer duty cycle, which at 800 pages per month is a bit on the lower side. The HP Laserjet Pro MFP M225DN Toner Cartridges are easy to replace and can be operated by even a layman. HP Laserjet Pro MFP M225DN is a good printer, which can give fast and good quality results. It has a long list of connectivity options and remote printing software, which together makes it a breeze to use. The features like fax, ADF, automatic duplexer and ePrint support makes it great choice for small office and home office users. How to Inspect damaged HP Laserjet Pro MFP M225DN toner cartridges? Examine the surface of the imaging drum on the toner cartridge. Do not touch the roller (imaging drum) on the cartridge. Fingerprints on the imaging drum can cause print-quality problems and you might not able to receive good printouts. If you see any scratches, fingerprints, or other damage on the imaging drum, replace the toner cartridge immediately with the new ones. If the imaging drum does not appear to be damaged, rock the HP Laserjet Pro MFP M225DN toner cartridges gently several times and reinstall it. Print a few pages to see if these steps resolved the issue. Even after replacing the cartridges if the quality of the printed document does not improve you need to contact the customer support services for their help. Q. While buying original HP Laserjet Pro MFP M225DN toner cartridges, each time the printer toner replacement, costs me very high. Please suggest me some low cost toner cartridges that can provide good quality prints. A. We would recommend you to buy compatible HP Laserjet Pro MFP M225DN toner cartridges for your printer, instead of original ones. The compatible toner cartridges will save upto 50% of your money, as compared to the original ones. Also, they produce as impressive results as the original ones. These compatible toner cartridges are available at Printerinkcartridges.ie and comes with 100% satisfaction guarantee. We offer good quality black coloured toner cartridges. Both single pack and multiple pack toner cartridge are available here. Q. What advanced features does this printer offers? A. The printer offers fax, Automatic Document Feeder, automatic duplexer and ePrint support. Q. I’m using HP Laserjet Pro MFP M225DN printer for my office use. Sometimes a ‘Toner Low’ message displays on my computer. How can I override this message? On the printer control panel’s home screen, click Setup. Touch the down arrow supply settings and then touch black cartridge. Type the percentage of the toner you want to remain in the cartridge, when the toner cartridge message displays. A. The connectivity options for this printer are via USB, Ethernet, Bluetooth and prints can be taken by HP’s ePrint technology. Q. I have used the fax function on HP Laserjet Pro M225DN for the first time and I have noticed that the fax quality is very poor. The machine gives out very light fax. Is something wrong with the fax function or the HP Laserjet Pro M225DN toner cartridge? On the other hand, if there is some problem with the HP Laserjet Pro M225DN toner cartridge installed, try replacing it with a new one. Also, the sender should darken the contrast setting on the fax machine before sending the fax. Increase the contrast and try resending it. Contact the HP support if you are not able to resolve the issue. Q. My HP Laserjet Pro M225DN does not print after setting up the wireless configuration. What is wrong? The machine should be working after verifying the conditions mentioned above. Q. Can you provide me with the detailed instructions to replace an HP Laserjet Pro MFP M225DN toner cartridge? A. When an HP toner cartridge approaches the end of its toner, you are required to order a replacement HP Laserjet Pro MFP M225DN toner cartridge. You can continue printing with the current cartridge at its low toner level until redistributing the toner stops yielding an acceptable print quality. Now take out the new toner cartridge from the bag. Place the used toner cartridge in the same bag for recycling. Hold both sides of the HP Laserjet Pro MFP M225DN toner cartridge and distribute the toner by gently rocking the cartridge. Make sure you do not touch the shutter or the surface of the roller. Bend the tab on the left side of the cartridge until the tab breaks loose. Pull the tab until all the tape is removed from the cartridge. Place the tab and tape in the toner cartridge box to return for recycling. Align the toner cartridge with the tracks inside the printer, and then insert the HP Laserjet Pro MFP M225DN toner cartridge until it is firmly seated. Close the top cover and lower down the scanner assembly. Q. I ordered HP Laserjet Pro MFP M225DN cartridge by mistake and wanted to return the same. I did not open the cartridge i.e. the cartridge is unused and intact. What should I do now? A. If you wish to arrange a return please contact us by telephone on 048 30833221 or email us on info@printerinkcartridges.ie. You can fill the form on : https://printerinkcartridges.ie/sales/guest/form/. All returns are viable 30 days from purchase date. Q. I need to do a lot of document printing (B&W only) on my office printer (HP Laserjet Pro MFP M225DN) is it possible to the toner while printing? I have a very limited supply of the HP Laserjet Pro MFP M225DN toner cartridge. A. Yes, you can limit the toner usage by turning on EconoMode on your HP MFP. Your HP Laserjet Pro MFP M225DN printer has an EconoMode option for printing drafts of documents. Using EconoMode make the printer use less toner. However, be aware that using EconoMode can also reduce print quality. We suggest you should not keep the EconoMode turned on full time (HP does not recommend that), doing so might outlast the mechanical parts in the toner cartridge. From the software program on your PC, select the Print option. Select your HP printer, and then click the Properties or Preferences button. Please note that if print quality begins to degrade and is no longer acceptable, consider replacing the toner cartridge. If this option is not available in your print driver, you can set it using the HP Embedded Web Server. Q. Hi! I am looking for a budget friendly toner multipack for my HP Laserjet Pro MFP M225DN printer. Can you suggest me a good quality but low cost toner cartridge for my printer?